May is shaping up to be quite the busy month, both personally and also for Cosmic Rage. 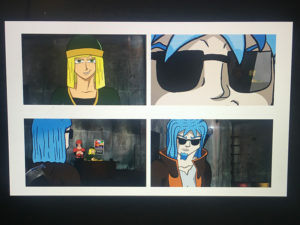 Script 2 is still in development, I have received some good feedback from trusted friends and still need to dive back into it and polish it up before jumping into storyboards. May is also a big month because Cosmic Rage will be showing at it’s first film festival and I will be attending. I spent this week laying out a lot of production art for an art show this month as well. I have pages prepared and dropped them off at the printer to get ready. I still have a couple more that I want to lay out. Those pieces would show more of the production of a scene, from illustration to inking, coloring and compositing. I look forward to sharing more about this process soon!